Cambodia aims to vent some tourist pressure through designated routes. 17 October 2007 (TravelVideo.TV) – There was a brief mention about new designated tourists routes in Angkor Wat earlier, and this article provides more information about the proposed tourist routes. Cambodian tourism has always had the problem of having too many visitors, which is causing the temples a lot of stress as even Siem Reap town struggles to keep up with the tourist bandwidth. Visitors to Angkor may soon have to follow designated circuit routes, designed to stave attention off Angkor Wat and bring tourists to the other temples in Angkor. Incidentally, there are already two circuit routes in Angkor, the Grand Circuit and the Minor Circuit, which take either an eastward or westward circular route around the temples. These routes are still rather long and I don’t think they can be done in a day. What I’d really like to see is smaller, thematic routes through Angkor, organised by period or ruler, that would give the Angkor tourists a chance to appreciate the Khmer temples even more. So maybe a Bayon-style route, or a Indravarman route, which would give tourists a reason to come back. As tourism in Angkor Wat continues to grow unabated, a new tourist route could alleviate some of the tourist pressure. For many years now, the Cambodian government has been looking for solutions to take some of the pressure out of the site. 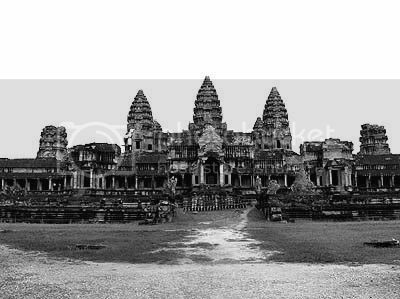 As the first seven months of 2007 brought 442,000 visitors to Siem Reap International Airport, a growth of 38 percent, Angkor Wat is poised to continue to take a beating from the hordes of tourists that visit the world heritage site. The Apsara Authority, which manages the Angkor Wat complex, recently introduced new paths with tourists taking different routes to enter and exit the temple. The objective now is to make certain that tourists do not flock to the site at the same time. The idea is to create circuits around Angkor Wat to spread the number of visitors and take some of the pressure faced by Angkor top attractions. Even if the committee plays only a consultative role, it has been able to avoid the development of the most incredible projects such as a subway to the temples. According to the Ambassador Desmazieres, Angkor Wat can indeed accommodate a fairly high number of tourists every day. â€œDuring the time of Khmer Kings, they were already thousand of visitors per day to Angkor Wat temples,â€ he said. The committee has also been working with Cambodiaâ€™s Ministry of Tourism for the creation of new tourist sightseeing such as traditional handicraft or silk producing villages. The most ambitious project is the development of a new tourist road, which would link Angkor Wat to the spectacular Preah Vihear temple, via the old city of Koh Ker where many temples can still be visited. Discussions will take place about tourism development from October 26 to 28, when the Coordinating Committee meets. In another development, Cambodiaâ€™s tourism minister recently signed a joint declaration with tourism ministers from Laos and Vietnam on trilateral cooperation at the meeting in Ho Chi Minh City. The ministers agreed to encourage their national tourism agencies to boost exchange of information and experiences in tourism development and promotion. They also agreed to jointly hold and attend tourism events and tours and cooperate in personnel training. According to published reports, Cambodia, Laos and Vietnam, under the â€œthree countries â€“ one destinationâ€ scheme, will implement measures to boost tourism and cultural activities as well as encourage public-private partnerships with regard to tourism development. Check out the SEAArch bookstore for more books about Southeast Asian Archaeology. Angkor Wat deserves your vote!